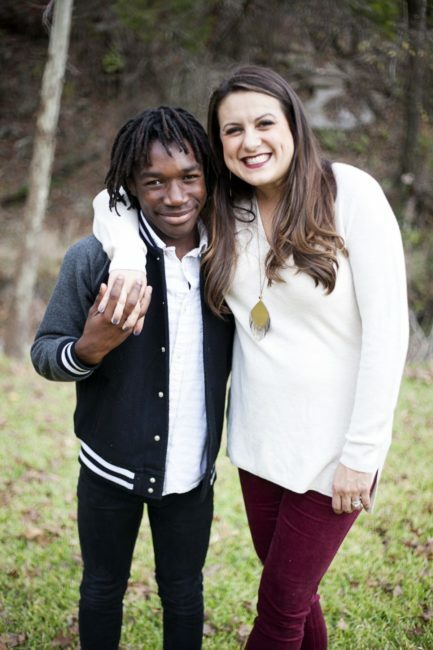 I get asked all the time … “what is your life like with your kids that are adopted”? I always answer the same way, “the same life that anyone else is living with four kids”! Although I get what they are asking, and yes there are hard days (since that’s what they are asking, right? ), but who doesn’t have hard days? This week marks eight years since our son, Amos, joined our family. Eight years is a long time you guys. I have a hard time remembering life before Amos, when I just had three kids, and before that just two kids, and before that just one kid, and before that none! On the way to his basketball practice tonight I recounted every single trip that I ever took to Haiti to visit him. I told him about my first trip to Haiti when I didn’t even know he existed, but God was doing some miracles in my own personal life through that trip. I shared about the next time I flew to Haiti, and I was all alone. My first international trip alone, and my first time to hold my babies. It seemed like I should have been nervous and scared to travel to a third world country alone, but not much can stop a momma from getting to her babies. I told him that the next trip was when I turned thirty in Haiti and it was also the first time his daddy met him and his sister. Then the next time I visited him it was right after a hurricane and we couldn’t drive the whole way to his village, so we had to get out and walk because roads were eliminated from the storm. Then the next time we came to visit was for Christmas and Aaron was so sick with strep throat, but again not much will keep a parent from holding their kid. The last year before he came home was my hardest. At one point I said, I can’t do this anymore. I can’t go visit him and leave him, and I can’t do this to him anymore. I didn’t tell him that because he might not understand why it became so hard to leave him every single time. But I did go again, because as hard as it was, the reward of being with my babies for a week was worth it. Then I never visited him again after October 2009. The earthquake hit in January of 2010 and then 10 days later he was home. In the United States. In my arms. Forever. It was truly one of the happiest days of my life. These videos are still some of my favorite memories from this crazy adventure of getting our sweet boy home. Please notice the fungus on my face and the earrings in my hubby’s ears! Also, I make a statement in the first video about adoption that I would take back now, but whatever, we all grow and change and that’s life! Wow! What a beautiful story. I just cried watching the videos of the love that was shown. Our journeys ran parallel in many ways, and I remember crying and rejoicing alongside you. I love this picture and all that it represents. God bless your sweet family. Wow. What a journey. Thank you for sharing. Out of curiosity, what statement are you referring to? About adoption that you would take back now? These are completely stunning. My fiance and I want to adopt and we both watched these and SOBBED. So beautiful! Oh You have a BEAUTIFUL FAMILY!! 8 Years CONGRATULATIONS!! AMOS You sweetie are such a Handsome young man! I’m still crying typing thru tears!! How God Has BLESSED YOU!! I felt like I was there Cheering you on when you all reached home! Thank you for sharing your life with us!! Love out to you ALL huge HUGS!! Oh and I have FOUR children also 3 girls and My youngest is my son!! I’m Truly BLESSED..Easy and hard times! !